Change your body's composition to more muscle mass and less fat mass to lose the weight for good. You will lose more than just water weight loss. Keep fat loss as your main goal when trying to lose weight. It takes longer to transform your body's composition, so be patient. Its worth the wait. Quick weight loss gimmicks will leave you frustrated and heavier in the long-run. Don't just lose water weight. Burn body fat and lose weight! If you lose 20 pounds in 10 days using severe calorie restriction with no exercise (you probably won't have the energy to exercise), just about all of that weight loss will be due to lost muscle mass and water weight! The problem is further compounded if you gained weight without exercise. The composition of this weight gain is mainly fat and water retention. I have seen individuals with up to 70% body fat! One big cause of water retention is too much salt consumption (sodium). If you eat many processed foods and not many whole, natural foods, your sodium consumption is too high---and you will take on more water weight. So, you find yourself regaining this weight quickly when you begin to eat the carbohydrates, proteins and fats that your body needs. Why? Because you will also replenish water stores in your body's cells. Increase your muscle mass to permanently speed up your metabolism. Muscle is metabolically active tissue and your body has to work harder to maintain muscle. You need to build a lean body that will give you good health and one that will last through the years of your life. If you rush the fitness process, it won't work! You can maintain/increase muscle mass (and body fat decreased) throughout your life with weight training and cardio exercise. Weight training also helps to keep your bones strong (preventing osteoporosis). 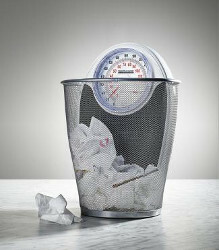 Lose your weight the right way to avoid the "yo-yo effect" of rapid weight loss and even more weight gain. You must maintain the right amount of caloric deficit to consistently lose weight. Severe calorie restriction for too long will lead to fat storage (your body's survival mechanism) and health problems. 1. Eat small meals of whole, natural foods every 3-4 hours. Also, eat protein with every meal. Protein will help you feel full for a longer period and help repair and rebuild your muscles. 2. Exercise regularly with strength training and short interval cardio sessions. Too many long, slow cardio sessions will eat away at your muscle mass. Don't become frustrated when one week you lose 5 pounds and the next week you lose no pounds. Muscle weighs more than fat. Check your body fat percentage. You could be burning fat, building muscle and losing inches. Your body shrinks (becomes leaner) because muscle takes up less space than fat. You will lose the weight at the right time. Be patient and eat right, build muscle, burn the fat and lose the weight! This process will give you a lean, healthy body.